Hennessy and the National Gallery of Ireland today announced the 12 finalists chosen for the Hennessy Portrait Prize 2014. Selected by an esteemed panel of judges; which included Dr Declan Long (NCAD), Donald Teskey RHA, Cristín Leach Hughes (The Sunday Times), Janet McLean (NGI), and chaired by the Director of the National Gallery of Ireland, Sean Rainbird, the 12 finalists were chosen from more than 400 entries from artists living in Ireland and Irish artists abroad. John Beattie from Co Donegal; An Artist, the Studio and All the Rest… (Part 1), 2014, HD colour video with audio. Since 2006, John has had a number of art residencies in Dublin at the Fire Station Artists’ Studio, the Royal Hibernian Academy, Temple Bar Gallery & studios and IMMA. Comhghall Casey from Omagh, Co Tyrone; Self-portrait, 2013, oil on canvas 40 x 30 cm. Since graduating in 1998 from Belfast School of Art, Comhghall has been painting full time with numerous solo shows. His work has been shown in the RHA, RUA and RA annual exhibitions. Gavan McCullough from Co Meath; This, 2014, oil on canvas 70 x 60 cm. Gavan is a self-taught artist and after completing his degree, spent two years in Italy during which he was drawn back to artistic practise through photography and sculpture. Cian McLoughlin from Dublin; Tronie, 2013, oil on canvas 40.6 x 30.5 com. A graduate of architecture, Cian went on to complete a Masters in Film studies in UCD before dedicating himself full-time to painting. Nick Miller London born, but Ireland based; Last Sitting, Portrait of Barrie Cooke, 2013, oil on linen 61 x 56 cm. Based in Sligo, Nick addresses portraiture, nature and human encounters through painting, drawing and film and has exhibited both in Ireland and internationally. Hugh O'Conor from Dublin; Beckah, Dublin Airport, 2013, photograph (film, B&W 120) on liquid acrylic, 101.6 x 101.6 cm. Hugh studied drama at the Samuel Beckett Centre, Trinity College Dublin and film at Tisch School of the Arts, New York University. He has also exhibited at the RHA, Dublin and RUA, Belfast. Geraldine O'Neill from Dublin; Is feidir le cat Schrödinger an dá thrá a fhreastal, 2014, oil on canvas, 200 x 210 cm. Geraldine has received a number of awards including the Henry Higgins Travel Scholarship, an Arts Council Bursary and the Gerry Tornsey Prize for Portraiture. Her work is represented in many collections including IMMA, the ECB, OPW and Glucksman UCC collection. Mandy O'Neill from Dublin; Cait, 2014, photographic print, 76.2 x 76.2 cm. A visual artist, Mandy’s work has been shortlisted for the 2012 Julia Margaret Cameron Award and included in the publication New Irish Works in 2013. Her main practises comprise of investigations into the local and the everyday, with a strong emphasis on portraiture. Helen O'Sullivan-Tyrrell from Bray, Co. Wicklow; The Convalescent, 2014, oil on canvas 40 x 50 cm. Helen studied painting at one of the Flemish art academies, Beeldende Kunst Overijse, and now paints from her studio in Brussels. Erin Quinn originally from Canada (permanent resident in Ireland); Adam (from the series 'Breaking Point'), 2013, photograph, archival pigment on fine art paper, 128 x 90 cm. In 2011, Erin was an invited artist at the 181st Royal Hibernian Academy’s Annual Exhibition, where she was awarded the prestigious Curtin O’Donoghue Photography Prize. Una Sealy from Dublin; Hibiscus Blues (Portrait of Douglas), 2014, oil on canvas 120 x 100 cm. Una has held eight solo exhibitions and has been selected for curated group shows in San Francisco, New York and Britain, as well as many in Ireland, and in 2011 was awarded the Ireland – U.S Council/Irish Arts Review Awards for outstanding portraiture. Saoirse Wall living and working between Dublin and Mayo; Gesture 2, 2014, HD video. Saoirse recently graduated with a first class honours BA in Fine Art Media at NCAD and has exhibited internationally, including at ‘setup, a devise’, Dublin, The Wrong Digital Art Biennale and the National #Selfie portrait gallery, London. The short-listed artists’ works will be exhibited in the National Gallery of Ireland from 8 November 2014 until 8 February, 2015. On Tuesday, 11 November, one artist will be announced as the winner of the Hennessy Portrait Prize 2014 and will receive a prize of €15,000. The winning artist will also be awarded a commission worth €5,000 to produce a portrait of an Irish sitter for inclusion in the National Portrait Collection. 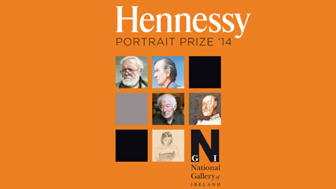 The Hennessy Portrait Prize was launched in March 2014. Open to artists in all disciplines, the competition’s aim is to showcase and encourage interest in contemporary portraiture, and to raise the profile of the long-standing and constantly evolving National Portrait Collection at the National Gallery of Ireland.